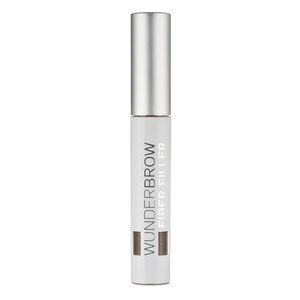 Gently filling the brows with long-lasting hair-like fibers, WUNDERBROW FIBER FILLER uses Fiberlock Technology to ensure that brows remain water-resistant, transfer-proof and smudge-proof for 24+ hours from the very first application. Available in the four shades of blonde, auburn, brunette and black/brown, WUNDERBROW FIBER FILLER creates natural looking and bushy brows. Further containing a brow Conditioning Complex rich in Vitamin E, Cocoa Butter and Keratin, the natural and healthy growth of brows is encouraged. 1. Start with a clean, dry brow. 2. Simply brush the powder through the brow with the applicator . 3. To remove, use an oil-based cleanser.